Generate a verification report by using the chapters of the document. Reqchecker PRO shall be installed. A MS Word document with chapters is available. When requirement are not identified by a specific syntax, the chapter numbers can be used as REQUIREMENT ID and chapter text as requirement text. This task show how to extract all chpater from a Microsoft WORD document. Right click on the file and select Add to coverage menu. A new project is automatically created and saved as new project.cover. Double click on the new project.cover file to open the main GUI. Select the file and select Syntax choice in Statement retrievel from: list box. Click on the Report > Verification Table menu. A dialog ask to select a new or existing report. 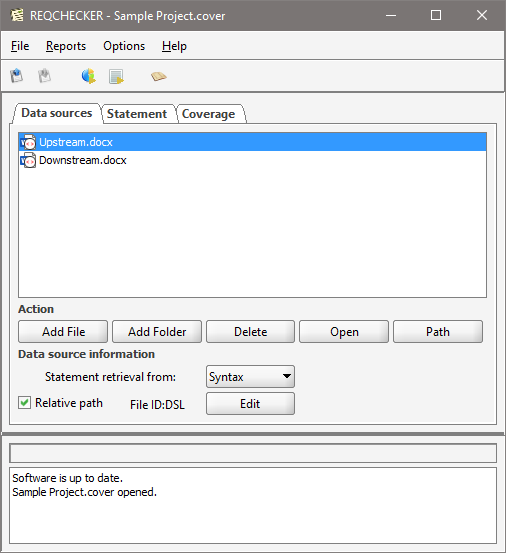 A new reports is automatically computed and opened. Click on menu File > Save to save you project on disk.